Quick, name where you ate if you lived near Echo Park in 2000: Barragan's, Pescado Mojado, Rodeo Grill, Freres Taix...the Brite Spot. There were a few more, none of them much of a culinary destination. Ten years later, Echo Park is a bustling nightlife area, detailed in last week's L.A. Times' article Echo Park Evolves Into Hipster Destination. As a beer lover, I'm excited for Mohawk Bend to open, but what most areas need even more than more bars are more casual, reasonably-priced places to grab a bite. Xoia picks up the vaguely Vietnamese thread that's always run through Echo Park (A1 Market, Phnom Penh) and fuses it to the hood's strong Latino background. and Owner Thien Ho brings a full Vietnamese menu with inspiration from the neighborhood and her husband Jose Sarinana's heritage, so you'll find pho beef or Mi Quang pork tacos (3 for $5.75) and banh mi sandwiches made with lemongrass pork carnitas ($6.50). All the phos - chicken, beef and vegetarian are $8.25, with a richly flavored stock that outdoes most of the other Vietnamese places in the immediate area. 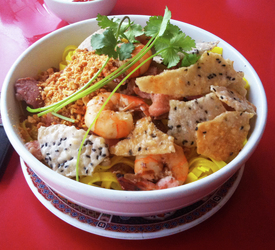 Several dishes go beyond the familiar pho and banh mi, like Mi Quang, a dish from Hoi An with thick rice noodles in a curry-flavored sauce with shrimp, pork and banana blossom and rice crackers on the side. There's also green papaya or chicken salad, Vietnamese coffee and housemade Vietnamese coffee ice cream, making this one of the larger Vietnamese menus in the area. Pros: Everything is fresh, tasty and reasonably-priced. Cons: No beer or wine. Service can be a little scattered, but when we received different dishes than what we had ordered, the server graciously wrapped up the extra ones for us to enjoy at home. Think I'm finally going to check it out now. Was that Bahn Xeo of the shatteringly crispy variety? haha. So glad that everything's went went well. What a cool experience.